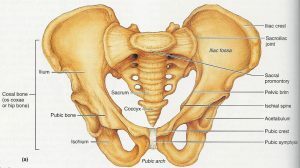 The iliac crest is the most prominent and the biggest bone of the pelvis. It is curved and concave in front, convex in the back and rounding inwards as well as rounding outwards. 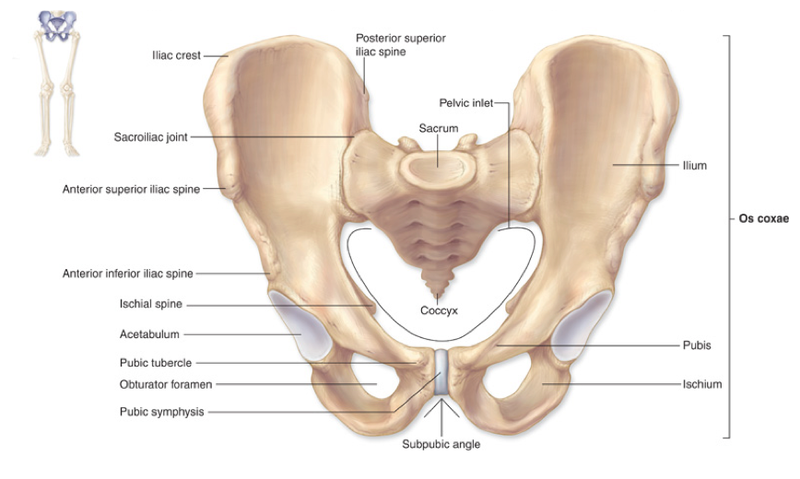 It is the superior border of the ilium wing and the superolateral boundary of the greater pelvis. Mainly, the iliac crest is responsible to protect the internal regions of the pelvic area. Also, it is the attaching zone of aponeurosis, muscles, and fascia of the structures nearby. The iliac crest lies below the rib cage. It is located exactly in the posterior of the superior iliac spines and the center of anterior. The tallest part of the iliac crest is at the L4 level of the vertebra. The tubercle of iliac lies 2 inches behind the anterior superior iliac spine. It is at the L5 level of the vertebra. The iliac crest is originated from the endochondral bone. The iliac crest moves posteriorly from the anterior superior spine of iliac or ASIS towards the posterior superior spine of iliac or PSIS. It divides into two different portions behind the ASIS – an inner lip and an outer lip. These two lip zones are separated by the intermediate zone. The outer lip protrudes laterally into the iliac tubercle. The iliac crest is convex shape from the superior and is palpable at the entire length. It is but sinuously curved, concave outward and inward. 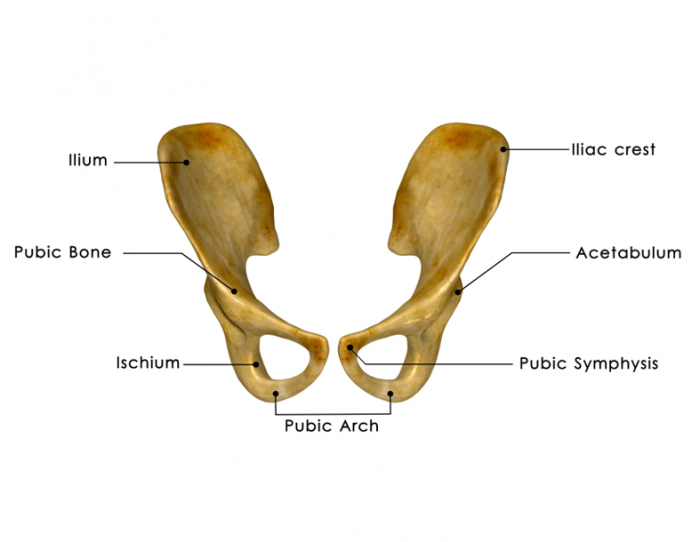 The center part of the iliac crest is thinner than the extreme parts. 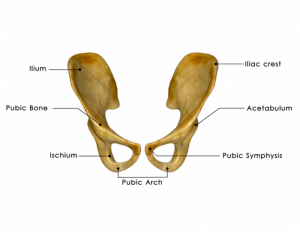 The iliac crest is the curvy superior border of the ilium. It is the biggest among the three bones that merge together to create the os coxa or the hip bone. It is placed on the lateral and superior surface of the ilium, which is very close to the hip region. If you will place your hand on the hips, then it is the skin above the iliac crest. Within its anterior, the iliac crest starts as a pointed bony system known as the anterior superior iliac spine. From there, it continues to the superior border of the ilium as a flat enlarged of the ilium. At the ilium crest’s posterior end, it narrows down and before it moves to another bony process called as the superior iliac spine. There are numerous muscles of thigh and trunks link to the iliac crest. The Sartorius and tensor fasciae latae muscles of the thighs have their own origins at the anterior superior spine. The external, as well as the internal oblique muscles and the transverse abdominis muscles of the abdomen, occur from the tendons move along the anterior boundary of the iliac crest. Also, there is latissimus dorsi muscle forming one of the numerous origins along the posterior boundary of the iliac crest. However, the posterior superior spine leads to the gluteus maximus muscle of the hips. The iliac crest forms one of the most imperative skeletal landmarks of the human body. It showcases a major portion of separating line between the pelvis and the abdomen. Clinically, it is used to find the level L4 of the vertebra to conduct lumbar punctures. The iliac crest is a highly imperative bone structure as it contains large sums of bone marrow. Doctors consider it as the best source of red bone marrow cells and the stem cells for carrying any bone marrow transplant process. The iliac crest is considered the safest place to harvest the bone marrow from the vertebrae in the spine. Furthermore, the volume of bone marrow extracted from iliac crest is usually similar to the spinal bone marrow. Also, the big bone that forms the iliac bone crest is considered a source of bone grafts. It is an excellent source for various types of facial reconstruction surgeries. The posterior region of the iliac crest offers support to the big volumes of bone. The iliac crest receives its blood from the deep circumflex artery. This artery caters the anterior iliac crest bone flap. This artery is the artery in the pelvis traveling along the iliac crest of the pelvic bone. Clinically, the iliac crest holds great significance. It has a large volume of red bone marrow and hence it is the bone marrow harvesting site to collect bone marrow and stem cells for transplantation. Also, it is an excellent source for bone grafting when the large sum of bone is required. The iliac crest pain is one of the common problems that may occur. Although this is not a very common problem, it can occur in older individuals, athletes, or those who stand for a longer time period. The pain in the iliac crest is mainly high, sharp, and sudden. It varies in intensity and can be felt along the crest extending towards the spine moving along the nerve path. Even it extends to the groin area through the hip. There can be various causes for pain in iliac crest. The iliac crest pain is also known as the iliac crest syndrome. The place where iliac bone and sacrum join together in the pelvis is known as the sacroiliac joint. It is one of the most imperative supportive joints of the body and does not offer much movement. 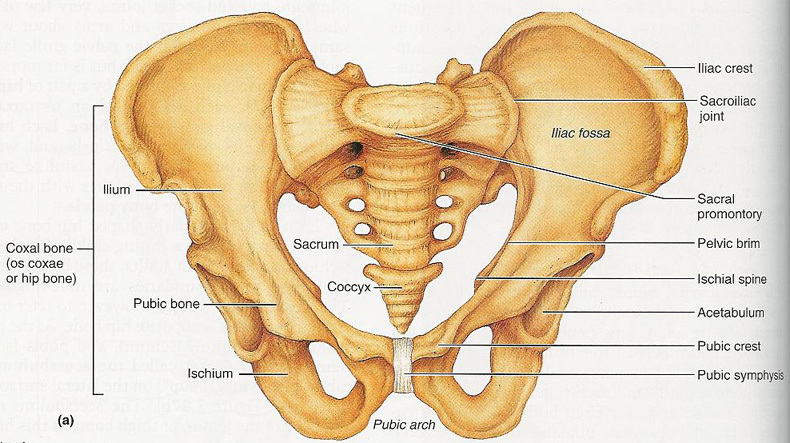 Muscle tightness, arthritis, trauma, pregnancy, and varying leg length can result in sacroiliac joint dysfunction. The gluteal muscle cluster links along the iliac bone and any aggravation or sturdiness in the muscle can cause discomfort and pain below the iliac crest. The discomfort and pain in this region can lead to problems in walking and limit the range of flexibility and motion. It is the inflammation or damaging of the iliolumbar ligament, which is a ligament stretching from the spine to the iliac crest. It mainly occurs by repetitive twisting movements and bending that irritates the ligament and results in inflammation. A hip pointer is also called as the crest contusion and any damage due to blow to the pelvis, a collision, or a fall at the crest can lead to this situation. In such situation, the blood vessels have damaged that result in bleeding of the surrounding tissue and bruises. It is a situation that causes pain and inflammation along the iliac crest. It is a region where the abdominal muscle links and continuous strenuous activity can result in inflammation and weakness of the muscle. Intense pain in the upper region of hip, swelling, bone bruises, and tenderness are the common symptoms of the iliac crest. Spasms within the muscles are another major sign of the inflammation. In such situation, it will become difficult to carry normal movement due to injury. Bending and twisting the body in various directions becomes difficult and even aggravates the pain further. Diagnosing the iliac crest injury contusion or injury is possible through an X-ray or imaging test. Even the doctor may perform computerized tomography scan to identify the extent of the damage clearly. If there is ossification then the doctor may even conduct radiography tests further. There are few exercises that can treat iliac crest pain. But it is always better to take advise from the doctor before beginning these exercises, especially if you are pregnant. Lunges, hip extensions, hip abductions, hip flexor exercises, and stretching exercises. If the severity of iliac crest pain is light or moderate then it can be treated at home by following few remedies. • The very first home remedy to treat iliac crest pain is to take proper rest. It is essential to take adequate rest for a few days till the pain is completely alleviated. • Applying ice pack can also help to ease the pain. • Gently stretching the muscles surrounding the iliac crest can be great to get rid of the pain. • The inflammation in the iliac crest can be reduced to a great extent with corticosteroid injection. Although, there are no proven ways to prevent iliac crest pain and even the pain is high especially during pregnancy. But, still, there are few methods that can be adopted in order to reduce the intensity of pain. • While exercising and stretching are the two best methods to prevent experiencing iliac crest pain, still, even a brisk walk can keep you fit and ensure that you don’t meet this pain. • Also, it is essential that you wear good quality shoes or appropriate athletic shoes, especially when the pain begins. • If you are suffering from such pain, then you must avoid moving on uneven surfaces. Walking on such surfaces can increase the intensity and level of pain. • It is vital to perform exercises to strengthen muscles near your iliac crest. This will prevent any major pain or injury from occurring. • Stretching the muscles and ligaments encompassing the pelvis and iliac crest prevents any pain or injury from occurring. Where is the tubercle of iliac crest located? The iliac tubercle of iliac crest is situated around 5cm posterior to the anterior superior iliac spine within the iliac crest in humans. The transverse plane including each tubercle is known as a transtubercular plane. What is iliac crest bone graft? The autogenous grafting of bone is a process in orthopedic surgery and is performed due to many reasons. The iliac crest is used as the main donor for such surgeries to obtain the autogenous bone graft. What are the sit bones? The tuberosity of the ischium, which is also called as the tuber ischiadicum, is known as the sit bones, or a pair of sitting bones. It is a large swelling on the superior region of the ramus of the ischium.